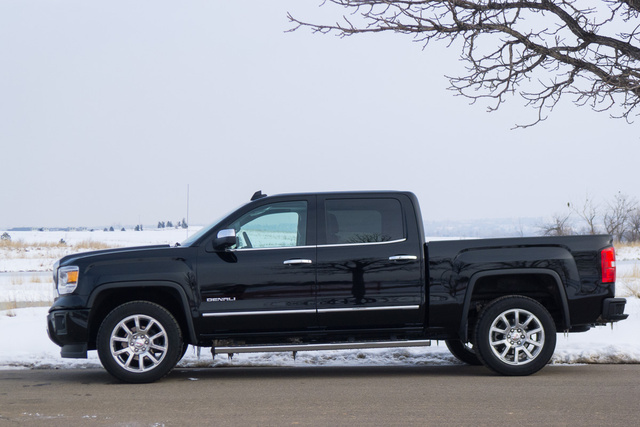 The grown-up 2015 Sierra 1500 carries on with last year’s significant improvements for the Sierra/Silverado twin light-duty, full-size pickups, including a highly functional interior. The Sierra 1500 capitalizes on its smart interior and mature exterior with commonsense improvements and creature comforts that are commonplace to many full-size pickups nowadays. With three different powertrains—one of which may be a little too much—and a bevy of interior features including an 8-inch touchscreen, the GMC Sierra 1500 places itself well among its competition. 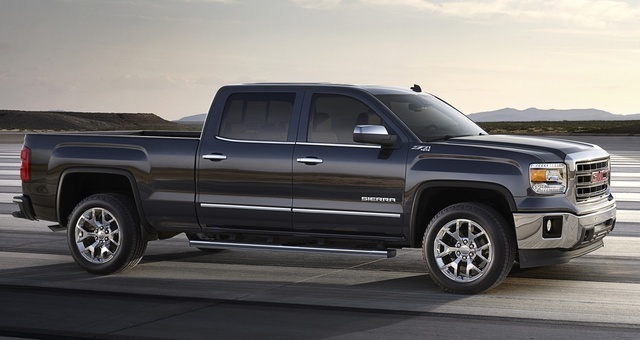 The 2015 Sierra 1500 is designed to be the grownup among the General Motors’ pickup twins. From the exterior, however, the styling is subtle like a neutron bomb. A massive bright chrome wire mesh grille on the Sierra Denali announces the truck’s arrival like a bar fight in "Road House." Large headlamps, flared front wheel arches, and a dramatically angled grille are distinctly masculine, which is to say, more Patrick Swayze. The Sierra comes in one regular cab configuration and two 4-door cab options. The Regular cab can either be fitted with a standard 6-foot-6-inch box or an extended 8-foot box. A Double cab comes only with a 6-foot-6-inch box, and Crew cabs can be mated to either a 6-foot-6-inch or shorter 5-foot-8-inch box. Inside, the Sierra is subtler with an emphasis on function. Three USB charging stations and a multitude of power outlet options come in handy for work on the go. The large, spacious center console has hangers for file folders, and the spacious back seat is suited well for rear passengers. The design was part of the Sierra’s overhaul two years ago, and the redesign has been well received by buyers and critics alike. Although the Sierra 1500 is a more refined pickup than it has been in previous years, its overall aesthetic is much more attuned to business-minded buyers who use the truck during the day, rather than after hours. The truck can be fitted with a 4G/LTE wireless hotspot connection that comes with 3GB of free data before buyers must pay for the feature. General Motors’ infotainment system, dubbed IntelliLink, is easy to navigate with an uncluttered interface that’s easy enough to understand after 5 minutes of use. GMC thoughtfully integrated OnStar, the truck’s on-board advisor response system, in more places with a 6-month trial for new buyers. The layout and design of the interior are plain, easy to use, and among the best in the Sierra's competitive set. The GMC Sierra 1500 is powered by a trio of motors that cover a lot of ground for the full-size pickup. First, the base Sierra, SLE, and SLT trims come standard with a 4.3-liter V6 that produces 285 hp and 305 lb-ft of torque on regular unleaded. That may be enough heft for many applications, especially considering the tow rating for that motor is still around 7,500 pounds, with 1,700 pounds of payload depending on spec. Like every other engine option in the Sierra range, the V6 can shut down cylinders to help save on fuel, but the reality is that those gains are minimal—the EPA rating for that engine with a 4-wheel-drive (4WD) powertrain is only around 17 mpg city/22 highway. 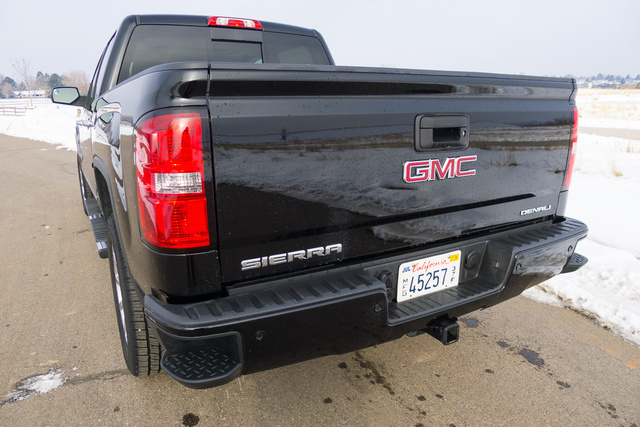 A more popular option for the Sierra 1500 in SLE and SLT trims is the 5.3-liter EcoTech V8. Like the V6, the bigger mill can shut down cylinders, but even with the bump in grunt—355 hp and 383 lb-ft of torque—fuel economy is relatively the same. Towing figures increase, depending on spec, topping out at 10,800 pounds for a trailer and 2,200 pounds of payload. According to the EPA, the 5.3-liter V8 manages 16/22 when equipped with 4WD. With proper power comes proper mileage. Both the V6 and 5.3-liter V8 are mated to a relatively smooth and simple, but aging, 6-speed gearbox that may or may not last another model year. Do you want to know how we know that? The top-shelf Sierra Denali comes with a massive 6.2-liter V8 that cranks 420 hp and 460 lb-ft of torque and sports a new 8-speed transmission that’s new for 2015. Despite the 20-percent bump in power and displacement, EPA estimates are only 15 percent lower for the bigger engine: 14/20 for the 4WD, which may be a credit to more cogs to run through. Hauling with the 6.2-liter is only marginally better than with the 5.3-liter: 11,900 pounds towing, 1,970 pounds payload. If you apply the Goldilocks principle, it’s clear that the Sierra 1500’s sweet spot is probably right in the middle. And in fact, the 6.2-liter feels a little overpowered—so much so that the rear axle can barely settle—and the 4.3-liter doesn’t realize much in the way of fuel savings anyway. Completely redesigned for 2014, the GMC Sierra is a much more refined pickup than it has been in previous years. Its ride is comfortable and light, and steering is responsive without being nervous. 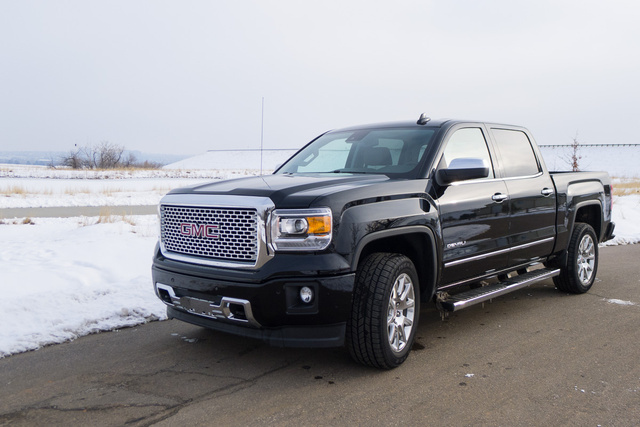 Our test truck, a Denali equipped with the optional Magnetic Ride Control suspension, helped level out rough pavement and smooth tough terrain. As you’d expect from any vehicle that weighs well over 5,000 pounds in any trim, it’s a heavy presence on the road. Available lane-departure warning helps keep the truck from wandering, but as you’d expect in tight city spaces, it’s still a bull in a china shop. Our Sierra Denali, which clocked in at nearly $60,000, was as comfortable as you’d expect. On long hauls, it’s tough to imagine any better place than the backseat for long trips short of a 4-star hotel. General Motors offers a few comforts to help make hauling and getting into its large trucks easier. Running boards and handles help entry, and footsteps near the bed help to hoist big bodies like mine into the bed more easily. The Sierra’s easy folding tailgate, which helps lower the heavy gate, is a commonsense addition for easier access to the bed. Want gripes? Visibility for drivers out of the Sierra isn’t great, and if you plan on using the back seat for cargo instead of people, folding the seats out of the way is a chore. As our Sierra Denali proves, there’s no option that can’t be fitted into the acres of open space in a truck. Heated and ventilated seats are available to any buyer with deep enough pockets, including the Denali’s adjustable pedals and 8-way power adjustable seats. If you can’t fit behind the wheel of one of these behemoths, you’re not trying hard enough. But behind the expensive options, General Motors has plenty to brag about. The infotainment’s system ease of use makes it one of the best, and the Denali’s Bose audio system sounds great. Despite massive 20-inch wheels, road noise is relatively quiet in the Sierra, and the big V8’s massive engine noise is dulled to a sedate roar within the cabin. According to the Insurance Institute for Highway Safety, the Sierra 1500 earned a Good rating in crash-test safety, including a Good rating in the oh-so-difficult moderate front overlap crash test. GMC also packs a suite of optional safety systems including the lane-departure warning system, front-collision alert system and active seat rumbling that vibrates your rear end and thighs based on where you’re drifting and which side you could potentially hit. It’s easy to get distracted behind the wheel of the Sierra—there’s a host of navigation, climate controls, instrument information displays, and connectivity options that offer a bevy of information outside of the road—but at least there are a few new additions that make sense. A hands-free Siri integration system for iPhone owners helps them send text messages without taking their eyes off the road. To be honest, I tried to connect my phone to the new system and didn’t immediately notice a difference. A rear backup camera is critical to help keep the tall Sierra from backing over anything that might fit underneath its massive rear end. Thankfully, the high-resolution camera is clear and easy and offers plenty of information, which is particularly useful when backing a boat down a ramp. The National Highway Transportation Safety Administration rated the Sierra 1500 with a 5-star overall rating, including a 5-star rating for frontal and side crashes. Rollover crashes were rated at a 4 stars. The Sierra 1500 covers a wide price range, starting at $26,605 and topping out at around $60,000 for a Denali model with every option box ticked. The best truck in the Sierra range may not be the end-all, be-all Denali, considering the truck’s massive amount of power. But considering its competition with the Ford F-150 and the Ram 1500, any flavor to suit any buyer is possible. The Sierra’s lack of alternate powertrains like the Ford’s EcoBoost or Ram’s EcoDiesel may hurt resale in the long run, but a recent dependability survey by JD Power awarded the Sierra 1500 top honors among its competition. 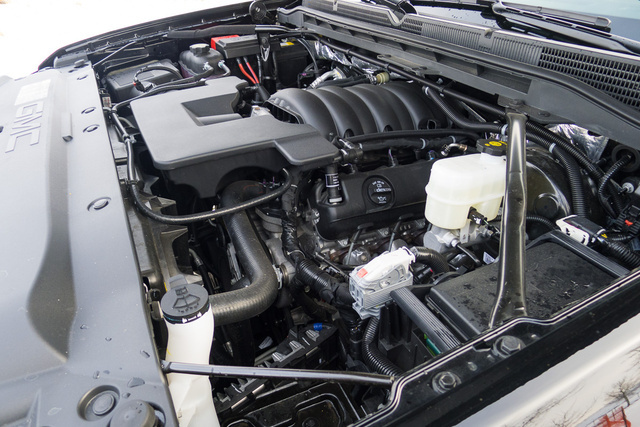 A standard, 2-year scheduled maintenance program covers the truck for up to 24,000 miles. 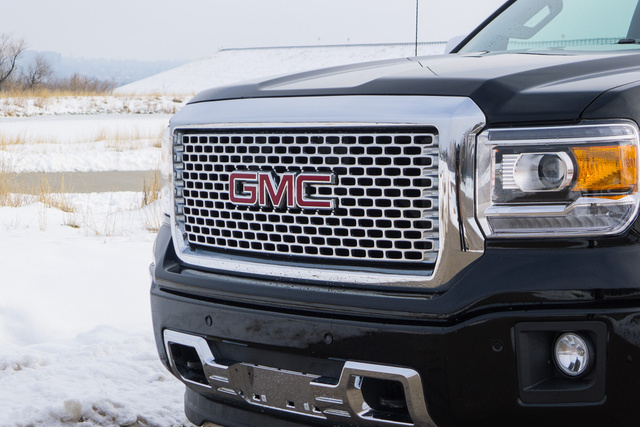 What's your take on the 2015 GMC Sierra 1500? 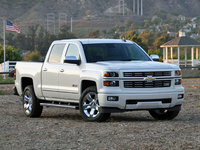 Users ranked 2015 GMC Sierra 1500 against other cars which they drove/owned. Each ranking was based on 9 categories. Here is the summary of top rankings. Have you driven a 2015 GMC Sierra 1500? 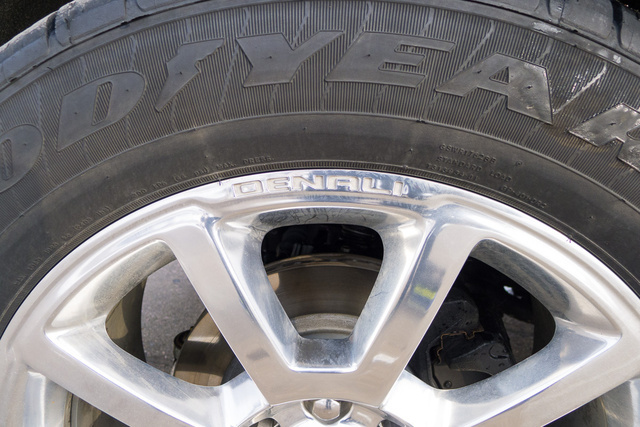 Will 20” rims from a 2016 Denali fit on a 2015 Denali?